You may have not heard of Julie Lee, but you have definitely heard music on Vevo. A founding member of Vevo, Julie helped revolutionize the music video industry. Immigrating to the United States as a child, Julie embarked on a journey that has since taken her across the world. Today, Julie is a business executive, entrepreneur, leader and mother. In fact, she is just as energetic and driven today as she was when she first arrived at UCLA. A natural leader, Julie served as President for a business club on campus. She remarks that the greatest thing about UCLA was the network and mentors she had. In particular, one of her most influential mentors was Dr. McGarry, the former chair of the UCLA Econ Department. A confluence of great beginnings happened as one of Julie’s first Economics classes was also one of the first classes taught by Dr. McGarry at UCLA. Julie remarks that Dr. McGarry mentored her outside the classroom even though she had no obligation to do so. These interactions taught her the importance of learning through experiences, and understanding how the knowledge you learn in the classroom translates into the real world. Perhaps the most crucial impact in Julie’s life was when Dr. McGarry encouraged her to apply to the Departmental Scholar Program (DSP). Julie was initially hesitant about the program, since it required her to add another year to her education which was beyond her financial means. However, Dr. McGarry told her to apply for the Regent Scholarship which would fully fund her education. Heeding her advice, Julie applied to both the programs. Given the high bar of being accepted into into the DSP, Julie thought she had no shot. However, Julie was wrong: she got accepted as a Department Scholar and a Regent Scholar. The Departmental Scholar Program proved to be the highlight of her life at UCLA. She got the opportunity to interact with graduate students who had a lot more experience than she did. She considered this to be an extremely humbling experience as she realized she was not the smartest person in the room. In addition, the graduate students came from a multitude of countries and walks of life. This was an enriching experience and prepared her for life outside UCLA. Furthermore, graduate classes were much more intimate. She believes the camaraderie that came from suffering together allowed all of the students to become extremely close. The is exemplified by the fact that she met Dr. Nahm, her best friend of twenty years on the first day of classes. Dr. Nahm, who is currently the Chair of the Economics Department at Kookmin University, and Julie are still as close as they were during their time at UCLA. After graduating with a master’s and a bachelor’s degree in 4 years, Julie entered the professional world by working at Ernst & Young. She describes moving into the professional world as being dropped into the ocean. However, due to mentors like Dr. McGarry, she was able to wade in the water through her numerous internships while still at school. Furthermore, by studying Business Economics at a large school, her transition into professional life was made much easier. She decided to work at EY because she wanted to understand the service industry and learn how to professionally manage money. She believes that these skills are important whether you are a CEO, CIO, or President, all of which are positions she has held in the past 20 years. After working at EY for a few years, Julie worked for Universal Music Group and then decided to move onto a project where she would have a larger impact. Beginning in the early 2000s, there was a substantive surge in music video demands; however, revenues for music companies like Sony and Universal were stagnant. To fill this void, Julie incubated a joint venture by Sony, Universal and Abu Dhabi Media which ended up as Vevo. While working at Vevo, Julie worked with companies like Google to redesign how music videos were distributed to consumers in the age of the internet. She played a key role in devising the hyper distribution model where consumers can access content whenever and wherever they want. Using then unheard-of media channels like YouTube and AOL, Vevo helped revolutionize how music is heard today. Vevo’s relationship was a landmark one in that it set the stage for a publisher ecosystem that ultimately paved the way for multi-channel networks. However, revolutionizing the world’s music doesn’t come without hard work and long hours. Working at Vevo eventually began to take a toll on her work-life balance. “While incubating Vevo, I incubated a little boy” wryly comments Julie. In the years after her son’s birth, she spent a lot of time at work and not enough with her son. One day, when she was working on the Asia strategy for Vevo in Singapore, her 4-year-old son asked her why she was working. Julie had no answer. On the flight back to LA, she contemplated the simple question her son had asked, and the very next day, she decided to start a ten-month transition process onto her next adventure. After departing from Vevo, she traveled the world with her son for 9 months which allowed her to spend quality time with him. It was her son’s curiosity that drove her to start EdTwist, a curated search engine for children. The project partnered with entities like UNESCO and JPL to foster curiosity among children. However, EdTwist eventually began to move in a direction which was beyond Julie’s realm of expertise. 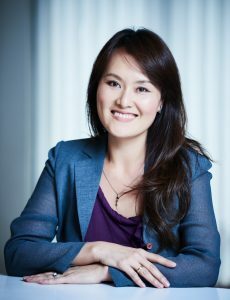 This subsequently spurred Julie’s recent move to Hong Kong to serve as the Chief Innovation Officer at Edipresse Media Asia, a premium media company inspiring, enabling and connecting communities of discerning consumers across Asia with brands including Asia Tatler. As an Asian mother, she wanted her son to live in Asia and become a true global citizen. She believes that although LA is described as a melting pot, it is really a salad bowl and the best way to learn about a culture is to live amongst its people. With a desire to work in a dynamic growing economy, she looks forward to the adventures which Asia has to offer. Julie attributes her success to her affinity to take calculated risks. She argues that as economists, we should never take decisions without considering the short and long-term return of our decisions. She often agreed to work for less money if the opportunity was a new adventure that promised good returns. Furthermore, her decisions are made based on four major factors: money, people, legacy and location, emphasizing that you need to understand your expectations and priorities. When she was fresh out of college, money was a very important factor. However, as her career progressed, her focus shifted away from earning money and towards other people and her own legacy. Her advice for students would be to embrace risks. An easy life is not an interesting life. Risks are intimidating at first. However, climbing over one mountain will give you the confidence and the motivation to climb over the next mountain. As you continue to take risks, you will become more and more comfortable with overcoming hurdles. She contends the importance of finding a network of people that support you when you fail. Her success would not have been possible without the support of Dr. Lee, her husband, and Dr. Nahm, her best friend (both extremely successful fellow Bruins). Going to UCLA has enabled her to acquire both a close network of supporters and a handle for calculated risk taking which has brought her success in her professional and personal life.